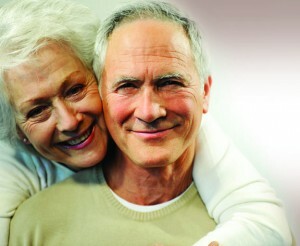 At RadiantCare, our goal is to assist our patients in every way possible to reduce the stress/anxiety of treatment. As one way to try and accomplish this goal, we have compiled answers to our most frequently asked questions when patients begin their radiation treatments with us. This simulation usually takes between 1-2 hours. You are welcome to bring a music CD or an MP3 player if there is specific music you would like to listen to during the simulation. 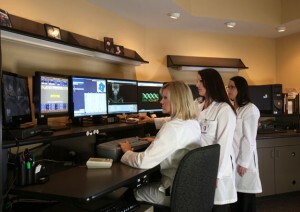 After simulation our physicians, dosimetrists and medical physicists will design a treatment plan specifically for you. We take special care to ensure that we design a plan that will deliver the prescribed dose to the tumor or target area while sparing as much of the surrounding normal tissues as possible. Read more about our services. How long does the treatment planning process take? Depending on the complexity of your case, it may take several days to two weeks to complete the treatment planning and quality assurance process. After your treatment plan is complete, it is carefully reviewed by our team of medical physicists and approved by your radiation oncologist. Only the treatment plans that pass our rigorous Quality Assurance process will be approved for treatment. The number of treatments varies. 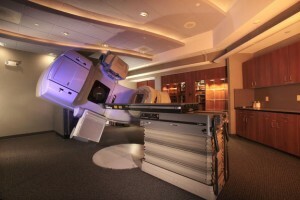 Radiation therapy is usually given five days per week (Monday through Friday). Treatments generally last from two to eight weeks depending on the total dose prescribed. 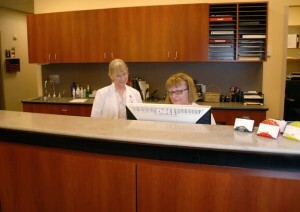 Daily treatment appointments generally take between 15-20 minutes. However, your first treatment appointment may take as long as 45 minutes. Will I be treated at the same time each day? Your daily appointment time will be established at the time of your first treatment. Unless there is a change in your schedule, this will be your treatment time for your entire course of treatment. If you need to change your appointment time for any reason, please let the radiation therapist know. We will do our best to accommodate your scheduling needs. If you are unable to make your scheduled appointment on time, please call us. We expect to be able to complete your treatment at the scheduled time. However, on occasion we may experience a treatment delay. On very rare occasion, treatments may also need to be cancelled. In the event that your treatment will be delayed or cancelled, we will do our best to inform you ahead of time. Please make sure we have accurate phone numbers where you can be reached. What happens during the treatment appointments? On your first day of treatment you will be greeted by one of our patient care coordinators and escorted to our patient-only waiting area. Depending on the area treated, you may be asked to change into a gown and/or scrub pants. Any jewelry that may be in the treatment area will also need to be removed daily for treatment. From our patient waiting area you will be escorted by the radiation therapist to the treatment room. Everyday before treatment you will be asked to provide us with your full name and birth date. This procedure is one of many quality assurance checks that will be performed daily before you are treated. Once in the treatment room you will be asked to lie down on the treatment couch. Any immobilization devices created during your simulation appointment will be used to assist you in holding still. Using lasers and any marks that you may have on your body, the radiation therapists will carefully align you with the treatment machine. The radiation therapists will exit the room and, depending on your treatment plan, perform a number of imaging studies to ensure that you are positioned correctly. While the therapists are out of the room, you will be under constant observation with the use of video cameras and an intercom system. 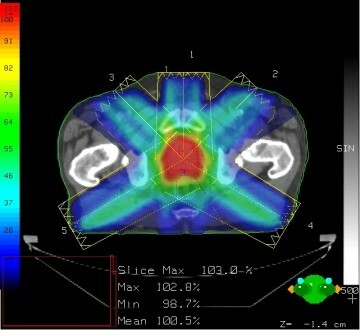 Once we have verified that you are positioned perfectly, the radiation therapist will deliver your radiation treatment. Will I feel anything during the treatments? The treatment itself is painless and only lasts a few minutes. The machine will make a humming or buzzing noise while the treatment is being delivered. How often will I see the doctor during my course of treatments? 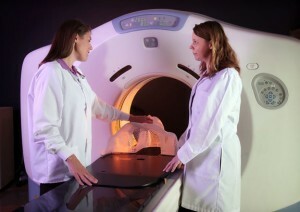 You will see one of our radiation oncologists weekly during your course of treatment. We refer to this weekly visit as your “Check Day.” This is a good time to ask questions about your treatments and address any side effects you may be experiencing. If you have questions or concerns between your weekly checks, please inform the radiation therapist and we will make sure your concerns are addressed in a timely manner. 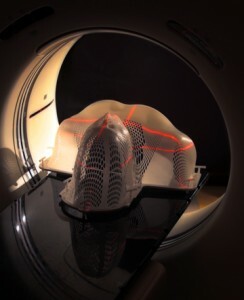 Questions and concerns while undergoing radiation treatment? While undergoing treatment we encourage you to make our staff aware of any questions or issues you may have. Our clinic hours are Monday-Friday from 8:00am until 5:00pm. We also have a physician on call 24 hours per day, 7 days a week to address emergencies. What happens when my course of treatment is complete? On your last day you will meet with the nurse to discuss continued management of any side effects you may be experiencing and coordinate follow-up appointments with RadiantCare and other providers as necessary. We will send a written summary of your treatment course to your referring providers. Please remember that we are available anytime by phone if you have any questions or concerns about your radiation treatments.